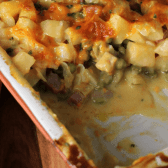 This Ham and Potato Casserole is a delicious and very simple dinner! Ham and potatoes smothered in a homemade cheesy sauce! It makes a big meal and it’s not expensive to make! Over medium heat, melt butter in a saucepan. Add onion and stir until softened, about 4 minutes. Add flour and cook an additional 2 while stirring. Pour in pour in chicken broth and milk all at once. Whisk over medium heat until thick and bubbly. Remove from heat and stir in cheese. Place 1/2 of the potatoes in a 9×13 pan. Sprinkle with ham and peas. Top with remaining potatoes. Pour sauce over top. Cover with foil and bake 45-50 minutes or until potatoes are fork tender. Remove foil (carefully, it will steam), top with remaining cheese and bake an additional 15-20 minutes or until potatoes are soft and cheese is lightly browned.